The Tuesday of our trip to France was our longest day out as we headed to Sarlat-la-Canéda and Domme, both places I'd visited years earlier on family holidays to France. Would I remember them? On the way to Sarlat was passed through Beynac and decided to stop to visit the castle on top of the hill. I was thankful that we weren't in peak season as I had to negotiate the narrow streets and park the car. After parking the car we walked up to the top of the limestone village to see the castle. We decided not to go into the castle, but had a quick look round the top if the village and spent some time at one of the vantage points looking out over Dordogne river and the valley below. In the distance we could see the Castelnaud-la-Chapelle castle in the distance. Castelnaud-la-Chapelle was held by the English during the 100yrs War and large catapults were used to fire between the English and French held Beynac. Leaving Beynac we headed onto Sarlat where I'd visited as a child on summer holiday with mum and dad. I had memories of meeting some family friends there and having a picnic in a little park near a river. My memory is obviously confused as Sarlat isn't on a river! Another stunning limestone town we had a quick look round the pedestrian area which was looking great in the late summer sunshine. We were keeping our eye out for somewhere for lunch and decided to stop in the small courtyard of Le Saint Julien tucked away in a backstreet. It was first, and only, menu du jour of the holiday. Full of seasonal regional ingredients it was great value at €12. You can't expect exceptional food at those prices, but nonetheless it was very tasty. 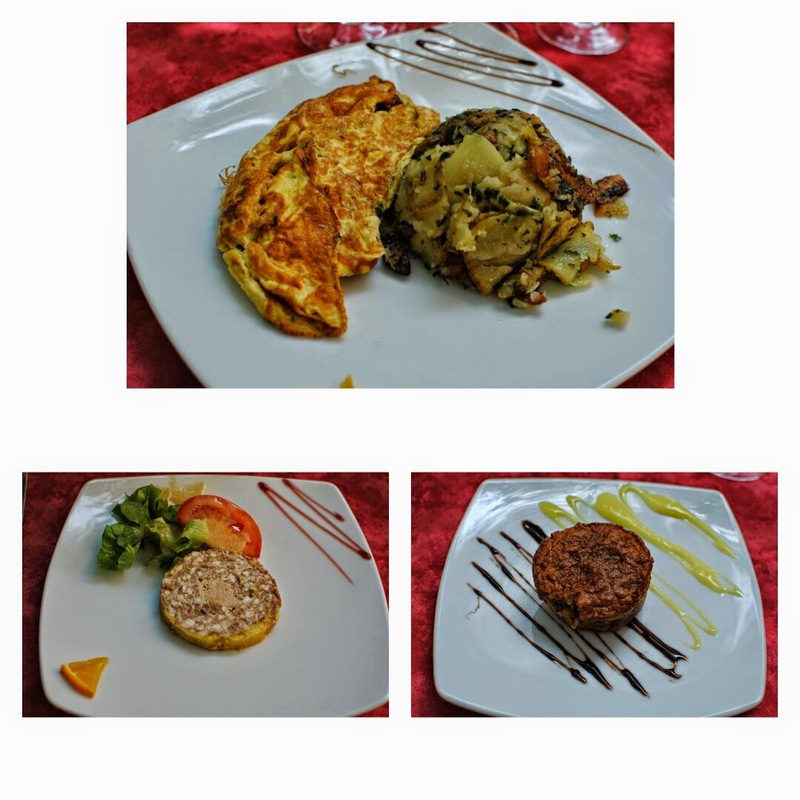 We started with paté with a heart of foie gras, the main was a cep omlette with some very tasty saladaise potatoes and dessert was a tarte au noix. After another walk round Sarlat and a stop at the post office to buy some stamps we headed onto Domme, another village I'd visited as a child. 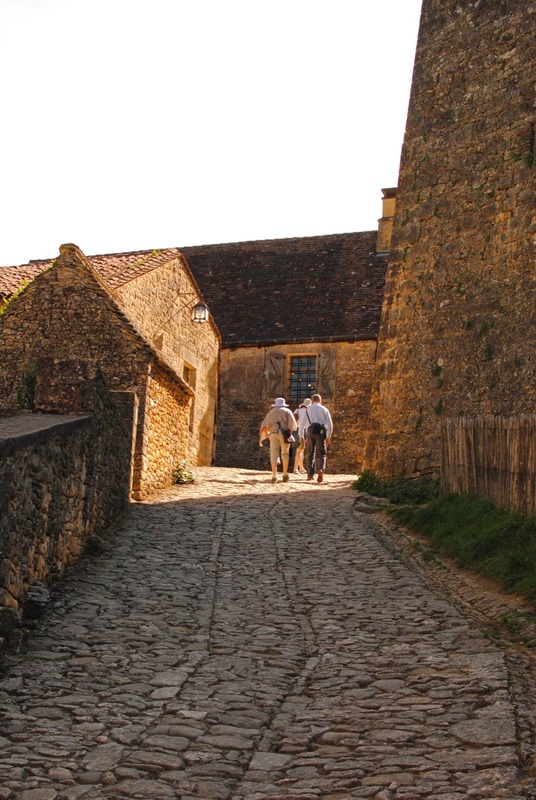 The walled hilltop village of Domme has very tight streets and it was a bit of a nightmare to find a parking space. I got a Dutch tourist 'excited' when he come towards me the wrong way in the one way system and I refused to pull out of his way until someone had pulled out of a parking space and I could slip in. Once in the village we bought some ice creams in the market square (excellent if you get to go) and sat eating them while looking out over the village below. I was too busy eating my two scoops to take any photos of Domme and the one below is the only pic I managed to take.